Language is considered as the lifeblood of human civilization. The Cambridge dictionary defines language as “a system of communication consisting of sounds, words and grammar, or the system of communication used by people in particular country or type of work.” India being a diversified country, it is Mecca of many languages and dialects, Nepali being one of them. Nepali is an Indo Aryan language and mainly has its origin in Sanskrit. Mainly considered as the language of Nepal, it is also spoken in many parts of India especially in North Bengal, Dehradun in Uttarakhand and also in large part of North East India. “Language is Our Life” reads the poster… where is that passion for our language? have we lost it? 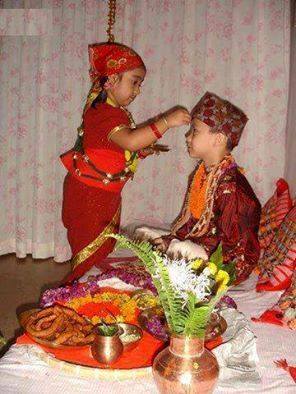 Due to similar culture and language of Nepal, they were misunderstood as Nepali citizens. The Indo Nepal treaty of 1950 further diluted the identity and nationality.So recognition of Nepali language became prime importance in order to solve these problems to a great extent. After the establishment of Nepali Sahitya Sammelan in 25th May 1926, the demand for use of Nepali language for official works was initiated. On 30th of July 1926, Bengal Government issued the official notice stating that “Nepali language” will be renamed as “Nepali.” On 8th January 1927, another official gazette was issued recognizing Nepali as one of the official languages of Bengal province. Regarding the education of Nepali language Bengal government on 24th July 1918 issued another notification stating that under Calcutta University, Nepali can be studied as one Vernacular in Intermediate, I.A. and B.A. courses. In 1953 one more notification was issued recognizing Nepali as a medium of instruction in school till intermediate. The President forwarded the letter to Official language reorganization commission and it was answered by the commission President B.G. Kher. Anand Singh Thapa also sends his further observations on a letter dated 23rd February 1956. After this, there is no record of any new progress. The citizens of Darjeeling were more focused during that time in the inclusion of Nepali as the official language of West Bengal. After a lot of struggle The West Bengal Official Language Act, 1961 was passed and Nepali was now recognized as the official language of West Bengal. The Next uprising of this revolution began in 1977 when Sindhi was included in 8th Schedule of the constitution. After 1961, the demand for inclusion of Nepali in the 8th schedule of Indian constitution was mainly confined to Newspapers and magazines. The magazines like Diyaalo and Diyo, the popular literary magazines highlighted these issues in their editorial column too. It was felt that these initiatives were not effective and was confined to a limited area only. 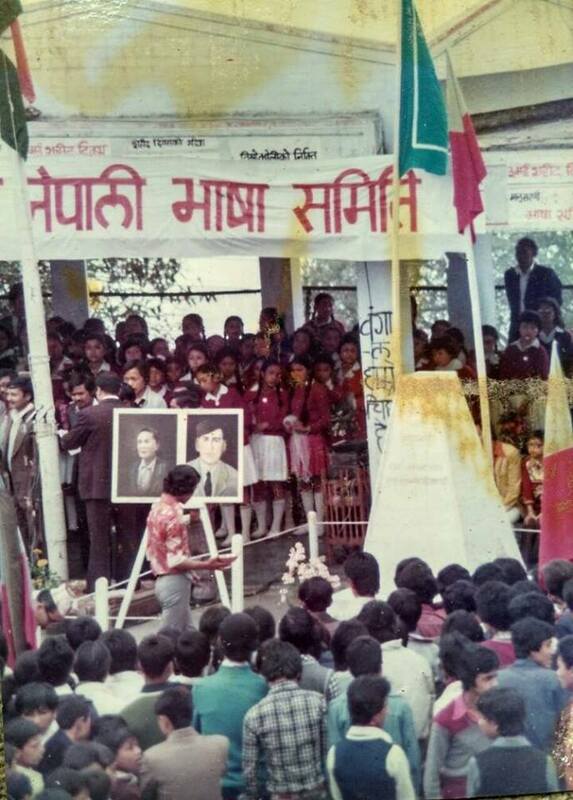 Comrade Ratanlal Brahmin won 1971 general election from Darjeeling constituency and on 22 March 1971 when he wanted to take oath as Member of Parliament in Nepali he was opposed and was not allowed. 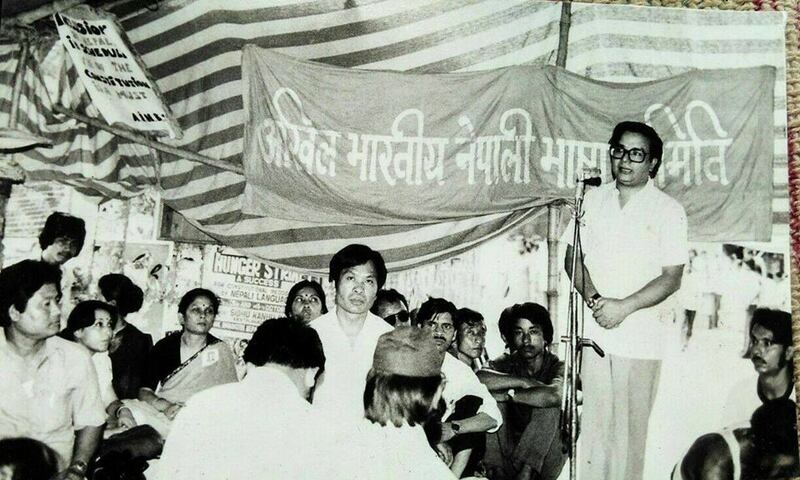 On 29th June 1971 during the session again Ratanlal Brahmin participated in discussion using Nepali. He was opposed, but he insisted and informed the house of his inability to speak another language except for Nepali, after which speaker had to allow him. 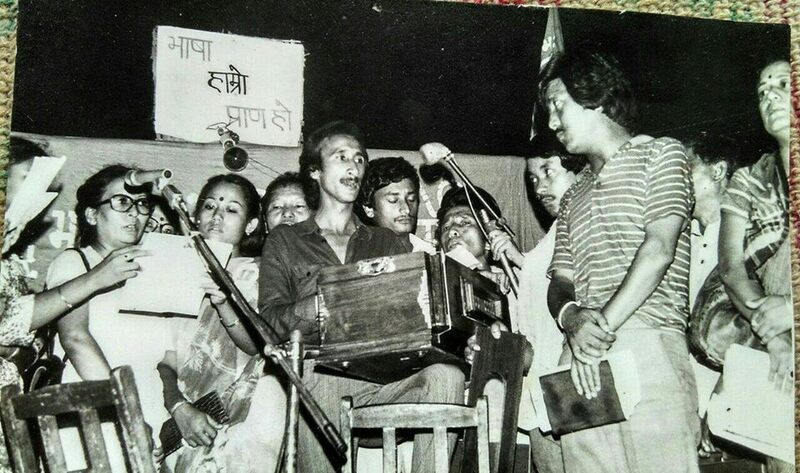 On 3rd January 1972 Nepali Bhasa Samity was founded which was later named as Akhil Bharatiya Nepali Bhasa Samity. The main aim of this Committee was to unify all cultural, Literary, Spiritual, social, political and other organizations in National level. The first public meet was held on 13th February 1972 where different communities and social organizations were invited and were appealed to support the cause. On 19th February 1972, another Public meeting was organized where all the major political parties were brought together. On 24th February 1972 third meet was held where all literary, cultural and educational organizations were invited. The head office was established in Darjeeling. All the organizations were requested to send official letters to Prime minister demanding the inclusion of Nepali language in 8th Schedule of the constitution.Resolution for the inclusion of Nepali in 8th Schedule was passed by Legislative Assembly by the state of West Bengal on 2nd July 1977 followed by Tripura on 28th June 1978 and by Sikkim on 22nd September 1982. The first delegation met the then Prime Minister Indira Gandhi on 11th April 1972. It was painful for the delegation to hear prime minister saying, “.The constitutional recognition of Nepali language should be viewed as a matter of security.” In the same year on 29th October, when she visited Darjeeling and opposed the recognition of Nepali, she had to face a massive protest itself in the meeting venue. Next day whole Darjeeling was shut down and people were on roads, with their demand. The Prime Minister Indira Gandhi had to call the delegation of Nepali Bhsasa samity on Raj Bhawan, Darjeeling where delegation submitted a memorandum to her. On 28th December 1972 the delegation of Bhasa Samiti, all the political parties of Darjeeling and representatives of the important literary organization met in salt lake to seriously about the issue. This meeting ended with the resolution of conducting an all-party meeting in New Delhi. The delegation of Committee went to meet the then Prime minister of India Moraji Desai on 29th September 1977. 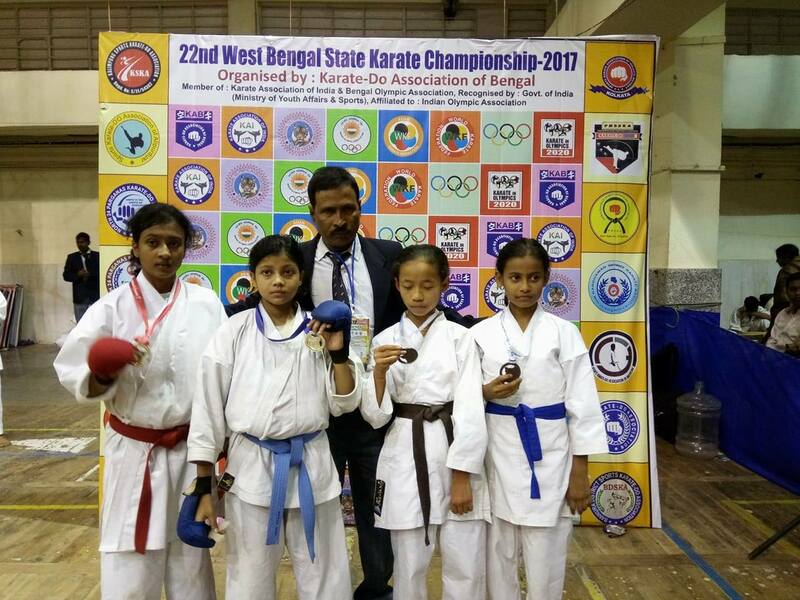 They were bluntly refused by the Prime Minister regarding the inclusion in 8th Schedule. During his discussions, Moraji Desai used sentences like “….You all wherever you are you have to adjust and sit, I would rather use, suppressed…” and when he was asked about the inclusion of Sindhi in 8th Schedule he replied “…Sindhi cannot be compared to yours. Sindhi are Indians; during partition, they came here. You all came to be recruited in the army [from Nepal] and you all are just residing in the different part of India. Shall I stop the recruitment of Nepali people in Indian army? When you are given place to adjust your elbow, you want to take everything.”This clearly showed the perspective of Indian government towards the Nepali speaking citizens of India. He too had to face a massive protest when he visited Darjeeling on 28th May 1979. It came to notice that in order to get a place in the constitution the respective language should be recognized by Sahitya Academy, New Delhi. This mission was also initiated by many literary and political organizations and an eminent person like Dr Parasmani Pradhan and Siddharth Shankar Ray. 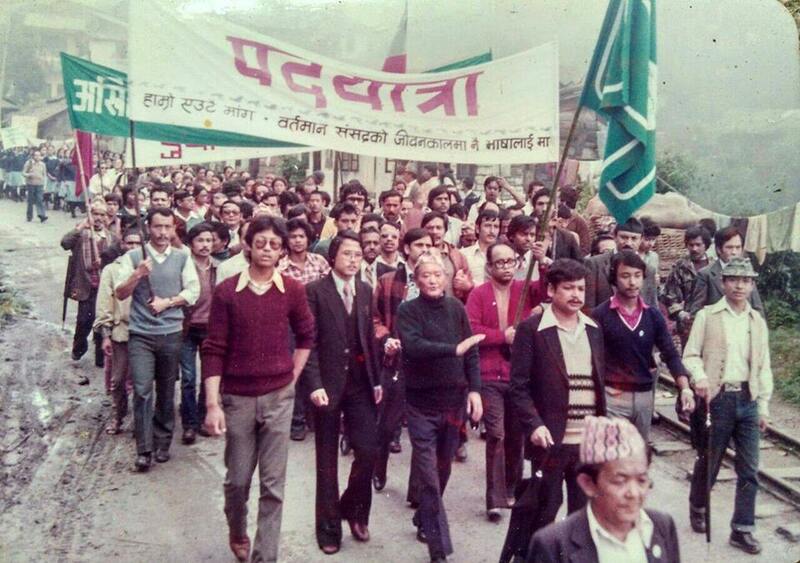 It was finally accomplished and Nepali got recognition in December 1978. In 1977 congress lost the election on centre and on 1978 Indira Gandhi again visited Darjeeling as Congress (I) president. She had long discussions with the Bhasa Samiti members and gave hope that if she returns to power the government will take their demand seriously. In 1980 Janta Government fell and Indira Gandhi came to power, but nothing was done. In order to draw the attention of Prime Minister National Meet was organized in Delhi on 7th and 8th November 1981 where Shri Pranab Mukherjee came as Government’s representative informed that the bill will be tabled on parliament on the first session of 1982. 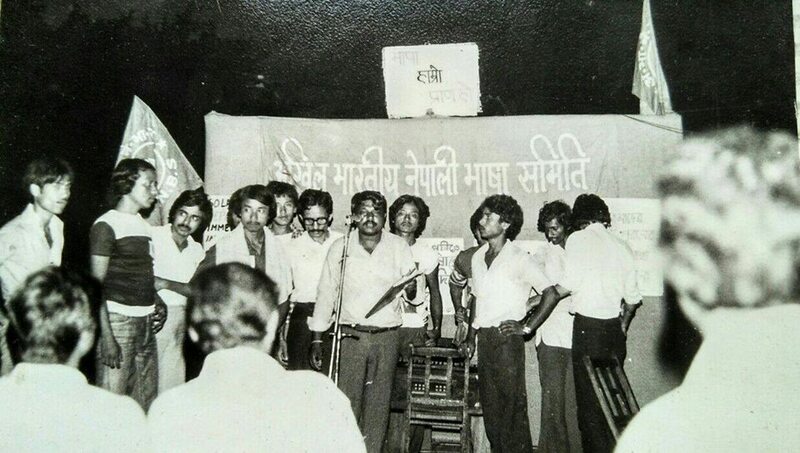 On 5th, 6th and 7th June 1982 Fourth National conference was held by Bhasa Samity and resolution were taken to make this issue strong in national level. The then chief minister of Sikkim, Nar Bahadur Bhandari assured that he will cooperate in all respect regarding the inclusion of Nepali in 8th schedule. Indira Government did not turn up and many Bhasa samity and Nepali speaking citizens of India kept pressing the issue through rallies, Dharna, writing in papers etc. but nothing was heard. Slowly the patience began to erode and on 2nd October 1983 three days hunger strike was started in the national capital as well as many places in India which was a grand success. Again the series of memorandum and reminders were sent to prime minister. On 31st October 1984, Indira Gandhi was assassinated. On 15th March 1985, CPIM M.P. 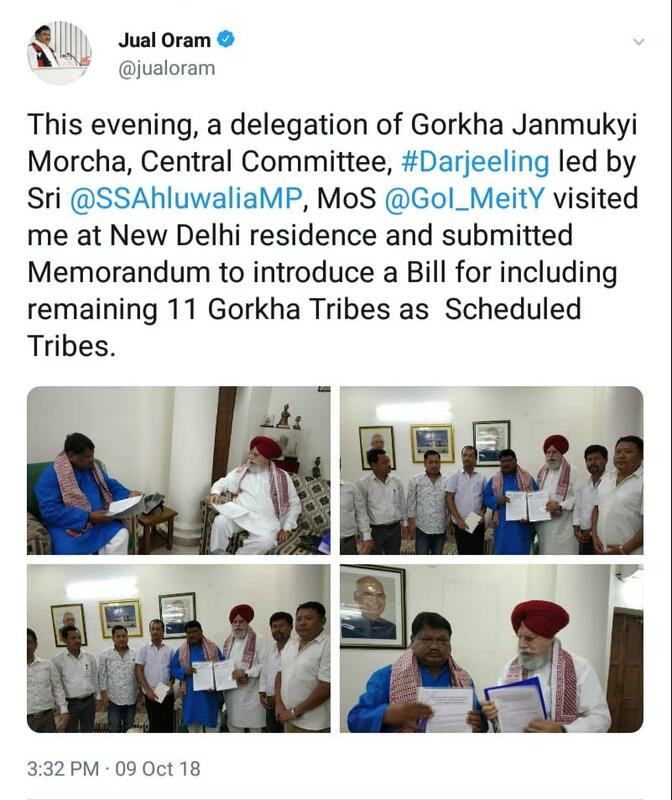 Sathya Gopal Mitra tabled bill regarding the inclusion of Nepali language in the 8th schedule and it was also covered with empty assurance by the government. Hope was diminishing and there were confusions and setbacks. 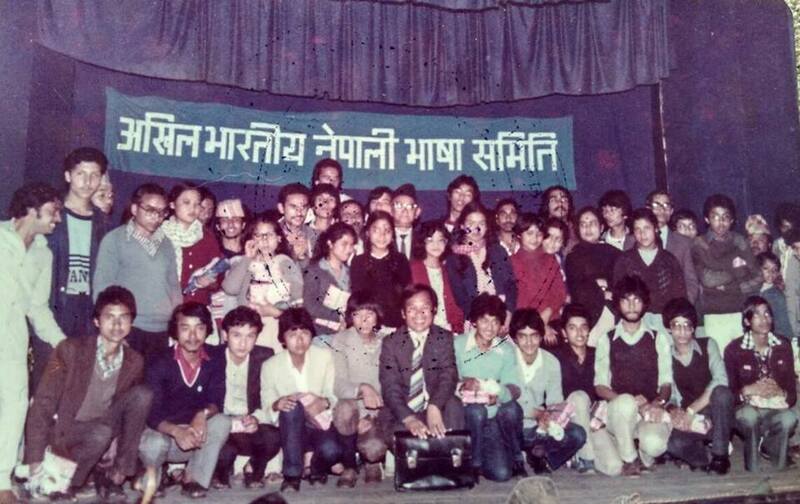 On 11th and 12th June 1990 All India Nepali language conference was organized in Gangtok. This two days conference gave birth to a new body, “Bharatiya Nepali Rashtriya Parishad.” which had the objective of Inclusion of Nepali Language in 8th Schedule of the constitution. It was headed by Chief Minister Nar Bahadur Bhandari. 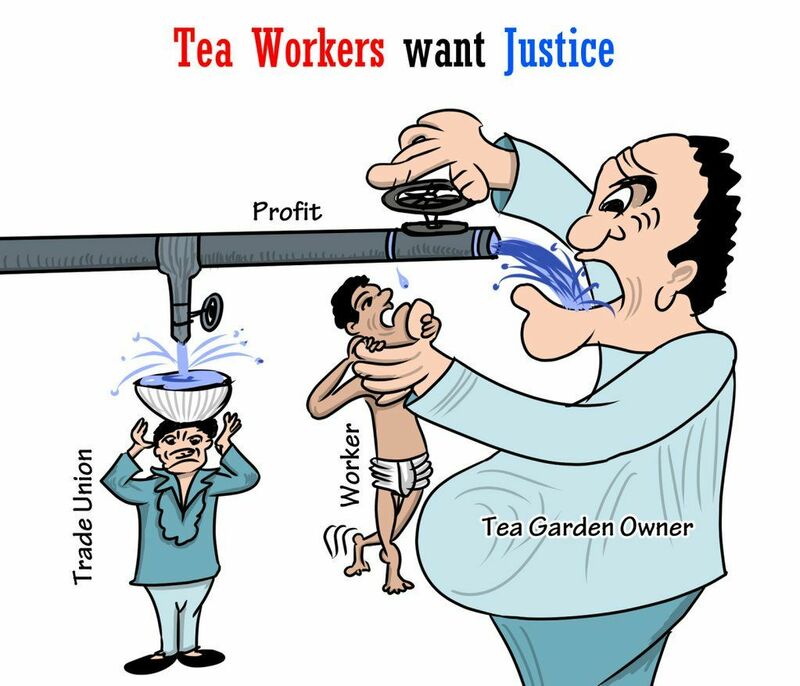 This organization took the agitation to next level. Nar Bahadur Bhandari himself went to Delhi in order to fetch support from many M.Ps. On 4th September 1990 delegation again met the then Prime minister V.P.Singh and discussed this matter in great detail. Again the moments of waiting were seen and no seriousness was seen on a part of Government. Sri P.V. Narshima Rao became the Prime minister. The delegation met him on 10th September 1991 and he also assured after listening to the delegates. The Parishad started conducting many seminars all around the country in order to create pressure to the central government. In 1991 general election Dil Kumari Bhandari was elected as M.P. from Sikkim which was the turning point for the language lovers. She tabled the private bill on this issue which was discussed on 24th April and 8th May in the parliament. In this long discussion, Dil kumari Bhandari clarified many doubts of the opposing parties. Prime Minister P.V.Narshima Rao then decided to call an all-party meeting on this issue. On 17th June 1992, Home Minister H.B. Chauhan called the all-party meeting. Since three legislative assemblies had passed the resolution, so it was not a problem for giving the green signal. Then Home minister assured that the bill regarding the inclusion of three languages in Indian constitution will be tabled in the coming session. It was the most hopeful moment for all language lovers. Finally, on 20th August, Lok Sabha passed the inclusion of Nepali, Konkani and Manipuri in 8th Schedule of the constitution with full majority. Mr R.B. Rai, the then Rajya Sabha M.P. writes, “…I got the news that bill is passed in Lok Sabha. I hurried to the central hall and found Dil Kumarai Bhandari and other M.P.s talking in a happy mood. There was happiness spread all over. She handed over the copy of the bill. In Number 2 of the main bill it was written – Existing entries 9 to 15 shall be renumbered as entries 12 to 18 respectively and before entry 12 as so re-numbered. The entry 11 Nepali shall be inserted. It was a moment of great satisfaction for me…” On the passing of the bill in Rajya Sabha, in his speech, He said, “I am overwhelmed by the trust and confidence bestowed on us. 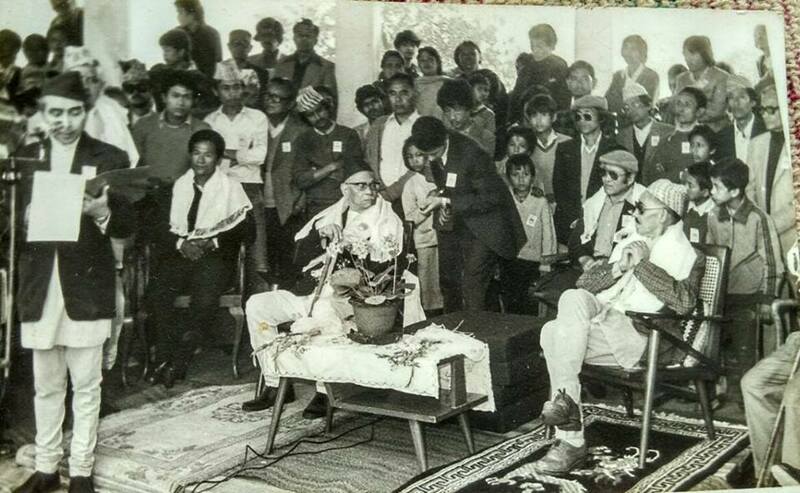 The historic event will go long way in cementing the process of the integrity of the nation in bringing the Nepali speaking people into the mainstream of national life by giving them an ethnic identity.” Thus the Notification on the Nepali Language was issued on 01.09.1992 which was seventy-first amendment of Indian constitution. The struggle for inclusion of Nepali Language in the 8th schedule of the constitution was historic event for the whole of Nepali speaking community of India. 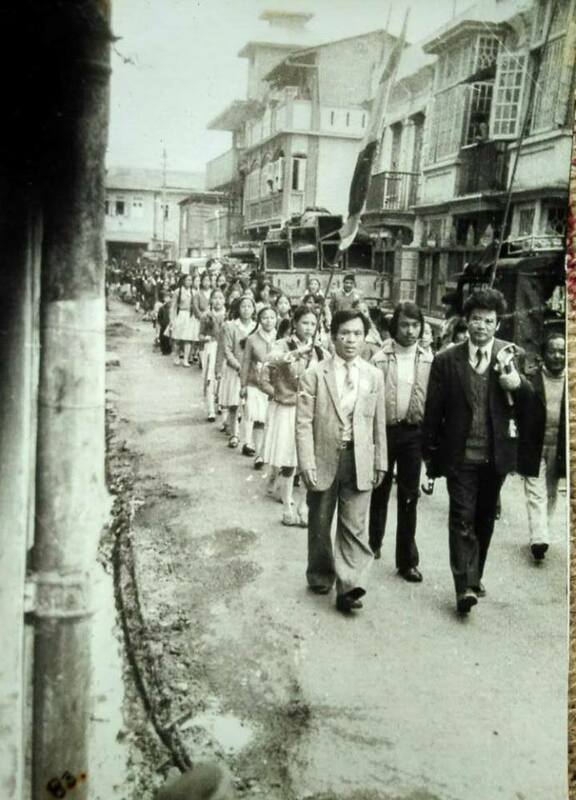 The first memorandum by Anand Singh Thapa to the passing of the bill on 20th of August 1992 went through series of setbacks and pains and sacrifices. So now the vista opens in front of us where we can explore how this language is treated by its native speakers as well as government now. The struggle was not easy and even the management and preservation of this status and language is also a great challenge in the hand of the present generation.